Every so often, along comes a new product which makes you wonder how it was never dreamed up before now. Meet the Potliner. An invention which promises to save hours of time spent removing dried on food stuck to the inside of Bain Marie/Gastronorm Pots. 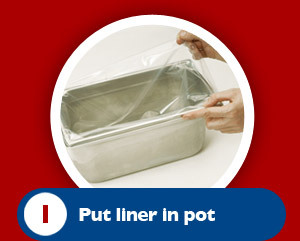 Potliners are heat resistant food safe polythene bags which sit in Bain Marie/Gastronorm Pots where food is being kept prior to serving. 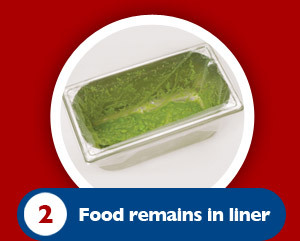 The food, once prepared, is placed into the Potliner for the duration of service. 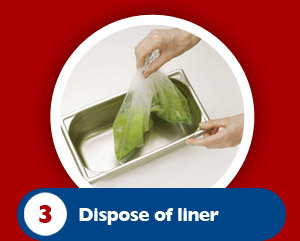 Then at instead of scrubbing and soaking the dirty pots – the used bag is simply disposed of in the recycling bin. This saves time, water, energy and staffing costs. You can clean down later. Keep selling product up to closing. Pays for itself! 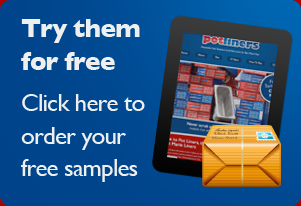 Potliners save time, money, water, electricity, gas, detergents etc. Potliners improve staff morale. Less cleaning, less muck, earlier to leave! 10 years, and over 8 million sold. Hundreds of hours saved, Thousands of litres of water saved, and countless amounts of arguments saved over who cleans the pots! 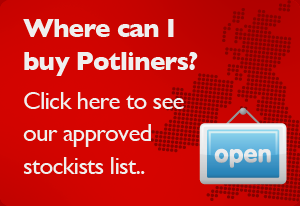 Isn’t it about time you tried Potliners?